Today I’m going to share my recipe for simple summertime iced coffee. It’s cold, sweet, and nutty with a strong coffee flavor. After having 1 glass of iced coffee on a hot afternoon, you’ll feel incredibly refreshed. It’s a shot of cool energy! 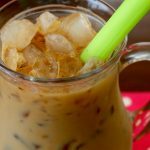 I’ve been making iced coffee like this for a long time, and have always used Maxim brand coffee with “prima” powdered cream. When I lived in Korea, most people drank instant coffee and brewed coffee was not easy to find. But you can use your own local variation on these ingredients. The important part is that the coffee shouldn’t be flavored, but it should be strong! 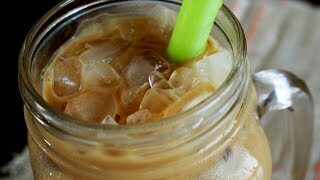 Enjoy the summertime, and have some delicious iced coffee! Combine the coffee, powdered creamer, honey, and the water in a quick shaker. Cover and shake for about 30 seconds Until mixed well. Pour into a glass and add the ice cubes. Stir well and serve. The ingredients are the same, but instead of 1 cup cold water, use ¼ cup hot water and ¾ cup cold water. Combine the coffee, powdered creamer, and honey in a glass. Mix with the hot water with a spoon until well mixed. Add the cold water and ice cubes. Stir well and serve. Posted on Monday, August 10th, 2015 at 9:27 pm. Last updated on August 20, 2015. Posted May 4th, 2018 at 1:40 am | Log in to reply. Iced coffee is now popular in the US, but 35 years ago, not so much. The first time I ever saw iced coffee was in Seoul at a small café. I am going to try this. Posted November 23rd, 2016 at 9:34 am | Log in to reply. I meant to add to my other post – yesterday we were in our Korean market to buy a Korean radish for the “relish dish.” (A favorite vegetable which we would not have known about without you.) They were giving out samples of Adlay Job’s Tears tea. It came in little individual packets, which I bought to put in Christmas stockings, as well as some for ourselves. So interesting, so delicious! Posted November 23rd, 2016 at 9:24 am | Log in to reply. Hi Maangchi! I was looking for Korean coffee recipes and hopped on your site. I haven’t checked in for a while. Tomorrow is Thanksgiving in the states and a little dish of your mak kimchi will be on the table along with the traditional turkey menu. I have an apiary and an abundance of honey, so your iced coffee recipe will be in the making soon. I will probably add a dash of red pepper to my glass too. Posted August 13th, 2015 at 9:54 pm | Log in to reply. What a fun summertime treat. When i saw the recipe this week, I thought, “Oh really? How can this be Korean?” But as usual, Maangchi delivered the authentic goods. Who knew there was Maxim instant coffee and Prima powdered cream in Korea? And the story about the department store disaster and its iced coffee-craving survivor was awesome. Maangchi has elevated the simplest of beverages to world-class level, don’t you agree? Even when she’s not cooking, she’s cooking! Posted August 13th, 2015 at 4:10 pm | Log in to reply. Would regular Coffeemate powdered creamer be okay instead of the one you have? I don’t think my HMart has the kind you used. Posted August 12th, 2015 at 5:21 pm | Log in to reply. Posted August 12th, 2015 at 4:06 pm | Log in to reply. That shaker you use to make you iced coffee was designed and originally marketed by Tupperware in the 1960’s and 70’s. It was opaque with measurements marked on the side for measuring ingredients as they were poured into it. The emphases was for mixing salad dressings but it could be used to mix other things such as eggs for scrambling. I took a quick look – Tupperware re-designed it extending the lip of the pour spout so it is now possible to drink directly from the mixer for stuff like protein drinks. It is in the Tupperware summer catalog for $16. Posted August 13th, 2015 at 7:34 am | Log in to reply. Yes, it can be used in many ways. I used to use it to mix my misu-garu (Korean grain powder), too. Posted August 12th, 2015 at 8:05 am | Log in to reply. It’s important for readers to know – most American brand instant coffees and powdered creamers won’t dissolve at all. Is the Korean stuff different, or do you just mix it very, very well? Posted August 12th, 2015 at 1:56 pm | Log in to reply. Mix the powdered ingredients with very little water (1 ts up to 1 Tbs); that will form a thick paste. Add the remaining water. This recipe was originally posted on August 10, 2015 at 9:27 pm by Maangchi. It was last updated on August 20, 2015. The video was watched 1,323,812 times on YouTube & has 35,296 likes!